Oxfam has partnered with Bigballs films to promote Africa's maternal health problems with a film starring model and writer Laura Bailey. The film aims to highlight the work of Oxfam in Ghana and appeals to world leaders to help extend their work to Liberia. It will be shown on the Oxfam website and Laura Bailey’s Vogue blog, and will be included in a mailer to the charity’s supporters. The film will also feature at the Bird’s Eye View Film Festival on 13 March, alongside other Oxfam films for IWD. It forms part of an initiative to encourages women to have a ‘do’ to raise money for women’s projects around the world. 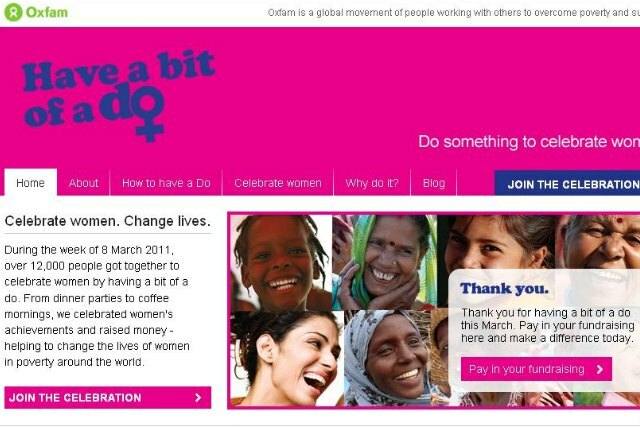 A dedicated webpage, www.oxfam.org.uk/celebration, encourages women to "do dinner, do drinks, do dancing, do something," and raise money for women in poverty. Sam Rowlands, director of Bigballs Films, said: "I jumped at the chance of helping Oxfam show what has been achieved in Ghana and appeal to the world to help them now make the same transformations in Liberia and other African countries." The film also supports the charity’s campaign, Equals , created by a coalition of more than 25 NGOs, women and arts organisations, including The Fawcett Society, Oxfam, Amnesty and Save the Children. Singer Annie Lennox is one of the several celebrities backing the campaign. Bailey said: "As a mother it’s hard to come to terms with the fact that in these countries pregnancy and childbirth are themselves life-threatening conditions, so making this film was an incredibly humbling experience."